[+] Added 'rawformat' and 'rawformatsong' that get unquoted strings with spaces (which is not allowed for 'format' and 'formatsong' designed for mIRC). Useful for API calls. [+] 'control minimize' and 'control restore' API functions to Minimize/Restore Player window. Winamp 2/5 only! [+] listindexformat config variable, sets printf format for the search dialog when index numbers are enabled, must contain placeholders for %d and %s in exactly this order. Modify with care, refer to the printf format specification documentation. Default format is now "%d. %s"
[*] Options redesign (and File Chooser is added now)! [+] $trunc(text,length) truncates string by length and appends "…"
[*] Now if you change some config setting via DDE it will be updated when you next time read it using $dde mPlug cfg_* ""
[*] Help updates, now quick start is available, please read it! 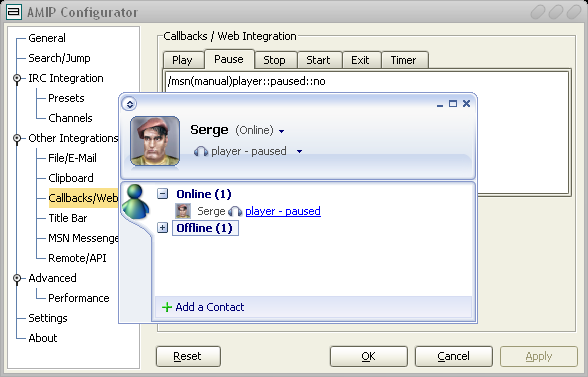 [*] AMIP WA3 version: wrapper 0.2 - buttons in configuration dialog are working now!!! [+] A lot of changes in shortcurts handling and clipboard integration. Special thanks to Robin Y. Millette (http://rym.waglo.com) for helping with this stuff and contributing the code! [+] It's now possible to change shortcuts for the search dialog and pasting to active window. Currently it's only possible in the plugin.ini manually, frontend will be added later. [*] No more restart needed when enabling/disabling hotkeys. [+] If Ctrl+Alt+Z shortcut for clipboard integration is not working, hit it twice shortly, AMIP will change the keystroke which it is sending to the active window for paste action from Ctrl+V to Shift+Insert and vice-versa, also AMIP will remember the application which needs non-standard keystroke. You can see that the keystroke was toggled by the window flashing. [*] Fixed /cmsg bug (/me used instead of /msg for all the channels except first). [*] A lot of typos in help fixed. [+] '/dde mPlug dump' command dumps all the AMIP variables and values to the status window. [*] Fixed 00:00 playlength, more bitrate fixes, better streams support, correctly restore after playing live radio. [*] If tag exists but is empty, use file name for %name. [*] fixed ^lb bug and other possible bugs with stripping. [+] Enable/Disable Ctrl+J and Ctrl+Alt+Z AMIP hotkeys option (requires restart). [+] Klient support. Check 'Klient mode' in the options dialog. Use '/describe #channel is listening to %name' command. You may also try to use internal AMIP commands /cme and /cmsg and add channels you want to announce at to the channels list in AMIP configuration. [*] A Leak with DDE server name not unregistered - fixed. [+] Clipboard integration. Preset #5 is used for clipboard format.To paste formatted string in any application use Ctrl+Alt+Z shortcut. The previous content of clipboard is automatically restored. [+] /dde mPlug setpirch on/off allows to switch from mIRC to PIRCH and back. Note: you will need to call /dde mPlug setdde <server_name> with appropriate server name to finish the process of IRC client switching. [+] /dde mplug setmapping on/off allows to change the way how AMIP communicates with mIRC from DDE to FileMapping and back. [+] /dde mPlug setdde <server_name> allows to change DDE server directly from your IRC. Can be used in scripts for publishing information to several IRC client instances. [*] Mask ~ sign in tags so now it's not stripped from output. [*] Workaround to get %br, %sr, %typ for the song if winamp was ran in the stopped state. [+] /dde mPlug autoplay on, /dde mPlug autoplay off - toggles autoplay after rfind and find commands. [+] "$dde mPlug fn <id>" variable can be used in mIRC to get name of file fromplaylist with specified <id> number"
[+] "$dde mPlug title <id>" variable can be used in mIRC to get title fromplaylist with specified <id> number"
[+] File mapping. Alternative method to pass string to mIRC. If DDE works slow on your PC, enable "direct send" option. [*] Strings starting with spaces are now correctly handled in config file. [+] Own playlist search dialog (like in winamp but with regexp search and international support)… Just press Ctrl+J. Also there is a Play Matched button to play all matched songs. [+] "$dde mPlug format string" variable can be used in mIRC. <string> is like config string.all variables are replaced. But <string> cannot contain spaces!!! Replace all spaces by '_' sign (underscore). [*] Buld a2: Fixed memory leak when using $dde variable in mIRC. Thanks to Shawn for reporting this bug. [+] Different encodings for file output. [+] You can use \n to write on next line while printing to file. [+] New variable %fdir - directory name (e.g. for C:\Music\Metallica\Best Of\Nothing-Else Matters.mp3) it will be set to "Best of"
[+] New variable %fupdir - up-directory name (e.g. for C:\Music\Metallica\Best Of\Nothing-Else Matters.mp3) it will be set to "Metallica"
[+] Any plug-in %variable can be retrieved from mIRC with $dde mPlug var_variable "" construction. e.g. to get %name write $dde mPlug var_name ""
[+] Any plug-in configuration settings can be get from mIRC with $dde mPlug cfg_* "". e.g. to get format string: $dde mPlug cfg_string ""
[+] if-then-else like constructions are now allowed. e.g. %?1<%1 - %2|%no> (if Artist is present then print Artist - Title, else print file name only) construction is recognized. [*] getplain command now may pass config string to mIRC script "/dde mPlug getplain "" <handler>"
[*] getcodes command now may pass config string to mIRC script "/dde mPlug getcodes "" <handler>"
[*] getlistlength command now may pass list length to mIRC script "/dde mPlug getlistlength "" <handler>"
[*] reindex command now may pass number of indexed songs to mIRC script "/dde mPlug reindex "" <handler>"
[*] A lot of code cleanups, perfomance improvements, memory leaks fixes. [+] "/dde mPlug getstrip" command to get config string without colors. [+] Format string edit box is now multiline! Press Ctrl+Enter to move a part of string to next line. This doesn't affect on the mIRC output. [*] Strange bug with missing variables in "getcodes" and "getplain"
[*] Fixed ID3 tag priority. Getting V2 tag instead of V1 if both are available.